Ufone has introduced a new way for you to recharge your account. Now you can recharge your friends or families prepaid accounts while on a living / visit abroad from designated outlets, ATM, Kiosk, Web or even handsets. This ground breaking facility is powered by Ezetop, MoreMagic and Transfer-To (Fixed & Mobile), Prepay Nation, Tranglo and SwissClear Global. 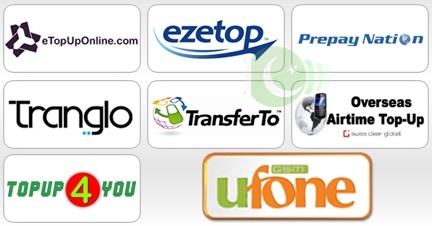 With their vast distribution network across the world all these partners offers Pakistanis living or roaming abroad to send credit back home to Ufone subscribers simply by walking into any retail shop or by visiting http://www.ezetop.com/ or http://www.etopuponline.com/ or http://www.gloreload.com/. MoreMagic has 15,000 outlets each in USA and in Canada whereas Ezetop has a wide network in the Middle East (UAE & Kuwait) and US. Every retail outlet is capable of sending across credit for prepaid users in Pakistan. ValuePLUS Computer Systems Ltd: is a Bangladeshi software company and has developed Topup4you.com in 2009, an online airtime recharge solution. www.topup4you.com is an internet based global service for migrant citizens living abroad. It provides easy and prompt way of Topup to destination mobile numbers from anywhere of the world. This is a 24x7 global service being internationally reviewed and used in 29 countries and 126 cities. How to transfer money from Phone to Phone (At present only available with Transfer-To): Currently, STC (SAWA) Subscribers in Saudi Arabia can send air time (Top-up) credits to their friends & family to any Ufone number (be the Ufone subscriber is in Pakistan or Roaming abroad) as followed: Send an SMS to 801500 with text 133* the mobile number you transfer to *amount reference (which can be 1, 2 or 3). For example: 133*00923331234567*3 (this will send PKR 500 to Ufone number 03331234567 from SAWA Connection using any Handset). For more latest updates and detailed information regarding this please visit Ufone International TopUp official page.